Why is cell service so much worse indoors? Walk in the door and your phone goes from four bars to one. Does that sound like you? Have you ever wonder why? The story begins in the 1890s with a scientist named Michael Faraday. Dr. Faraday figured out something interesting about electricity. He figured out you could put a wire mesh around something and shield it from electrical discharges. He proved that a person could stand inside one of his “cages” and even a bolt of lightning wouldn’t get through, even though a gentle breeze went right in. The reason, Dr. Faraday figured out, is that electricity travels in waves, and those waves are at different frequencies. Depending on the size of the holes in the cage, some electrical waves can get through and some just don’t. This is really important for radio and any sort of transmission (like cell phones) because almost everything electrical causes radio interference. What do you do if you have some big piece of electrical equipment that needs a lot of ventilation? Put it inside a “faraday cage.” Design the cage right and the equipment won’t cause problems for radios around it, yet it won’t overheat. Simple, right? Sometimes a faraday cage works too well. Since the late 1960s it’s been common to build houses out of stucco. Stucco looks good, it’s durable and waterproof, takes paint well, and gives some natural insulation. Unfortunately it doesn’t stick to smooth surfaces. Stucco mesh, like the image at top, is used to give stucco something on which to stick. There’s only one problem…. Stucco mesh is wire mesh wrapped around your whole house. Does that sound like anything else we were discussing a few paragraphs ago? Right. It turns out that stucco houses are big faraday cages. To make matters worse, the common sizes of stucco mesh are just right for blocking cell service. Oh, you say, your house has plenty of windows. Great but… are they designed to keep heat UV radiation out? It’s possible it’s keeping out other RF radiation too… like cell phone service. Your house also has a lot of wires, conduits, and metal boxes in the walls. Radio waves (like cell signals) work a lot better in large open spaces. Inside your house they bounce around and get weaker. Not only that but your fluorescent lights, microwaves, even your TV might be causing problems. Devices like those aren’t supposed to interfere with cell service but over time their shielding can crack or fall off. 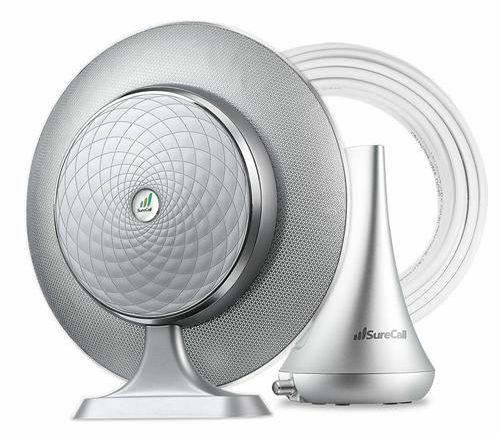 If you’ve got bad cell service indoors, the answer is simple: a cell booster. Cell boosters take the signal from outside and bring it inside through a cable, then retransmit it in the house. A lot of people think cell boosters are those little stickers on the back of phones. Those don’t work, period. Cell boosters cost more, but they are based on real physics, not mumbo jumbo, and they actually work. Don’t settle for bad service and don’t blame your new phone… just get a cell booster! Nice and Easy: How high up should your outdoor cell antenna be?